Neil Macdonald looks at how a longtime e-mail smear campaign claiming Barak Obama is an unpatriotic muslim may be working against Republican party candidate John McCain. Is the discredited smear campaign backfiring on Republicans? The "moment in Minnesota" appeared last Friday like the white, infected head of a pimple - impossible to miss, hard not to stare at, and embarrassing, at least to John McCain, who wants to present an unblemished face to the voting public. Wearing her bright red McCain-Palin T-shirt, Gayle Quinnell rose from the crowd at a rally in Lakeville, Minn. to give her candidate a little of his signature straight talk. 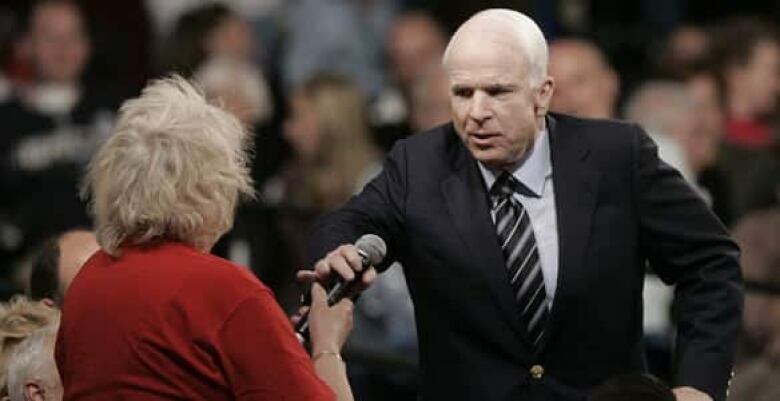 "I don't trust Obama," she announced, as McCain nodded enthusiastically. Then she continued: "I have read about him. He's an Arab." And there it was. Centre stage, on camera, about as public as you can get. The political pus that's been building for nearly two years under the surface of this presidential campaign, oozing forth in broad daylight. McCain, a politician who's been around long enough to recognize a "moment" when he sees one, cauterized quickly. "No. Nope. No, ma'am. No, ma'am," said the candidate, grabbing back the mike. "He's a decent family man citizen that I just happen to have disagreements with . . ."
But, setting aside the internal implication of McCain's reply — that Obama can't be an Arab if he's a decent citizen and family man — and its impact on the sensibilities of this country's 3.5 million Arab-American citizens, McCain cannot have been too surprised by what he faced on that stage. Because his campaign has helped create it. Gayle Quinnell is in fact the collective voice of hundreds of thousands, perhaps millions of Americans whose nativist fears Republicans have been stoking for months. The Americans who have been passing on smear-mails for years. "Beware," said the first one I saw, back in January of 2007. "Obama takes great care to conceal the fact that he is a Muslim." It went on to reveal that Obama's African father was a "radical Muslim." and that Obama himself had studied at an extremist school in Jakarta. Other messages declare Obama refused to be sworn into the Senate on a Bible. Or that he refuses to recite the pledge of allegiance. The e-mails are patently false, and have been widely debunked. But whisper campaigns are as persistent as the flu. Clearly — witness Ms. Quinnell in Minnesota — the message has had an effect. Any reporter who's covered this campaign has seen it. I heard it in May, as parishioners gathered outside a Baptist church in North Carolina. And I've heard it in the highly-educated, genteel suburbs of Washington. A colleague says he's encountered the same thing in Indiana, Pennsylvania and Missouri: "It's usually 'I know he says he isn't, but I think he's a Muslim.' You hear it everywhere." The whisper campaign seems particularly directed at Jewish voters, playing on their fears that Obama might not be pro-Israel enough, or that he is somehow in league with Muslims, read Arabs, read terrorists. But Jewish readers of the New York Times might have been surprised this week by an article that identified where a lot of this stuff originated: Andy Martin, a conspiracy theorist who once set for himself the goal of "exterminating Jew power." Martin is apparently fond of filing lawsuits, some of which use even more pungent anti-Semitic rhetoric. He once filed a brief calling a judge a "crooked, slimy Jew." Martin evidently isn't too keen on Muslims, either, and he was one of the first out of the gate questioning Obama's heritage. The Times investigation traced the origin of the smear-mail campaign to Martin's self-published writings. And by the time the presidential race got under way, the e-mails had laid a foundation for organized conservative attacks. Speakers at Republican events began referring to "Barack Hussein Obama," with heavy emphasis on their opponent's middle name. At a McCain rally in Iowa, Rev. Arnold Conrad told the crowd: "There are millions of people around this world praying to their God — whether it's Hindu, Buddha, Allah — that [Obama] wins, for a variety of reasons." Those people, declared the churchman, would think their God bigger than the Christian God if that were to happen. Early on, McCain himself demurred. He chastised a conservative talk-show host for warming up one of his crowds with the "Barack Hussein Obama" line, and distanced himself from Rev. Conrad: "I will not tolerate anything in this campaign that denigrates either Sen. Obama or Sen. [Hillary] Clinton," said McCain. But this fall, as Obama's campaign gathered force, McCain evidently decided to tolerate some mud after all. Speakers introducing him at rallies again started using the "Barack Hussein Obama" line, now with the Republican candidate standing nearby smiling. And McCain's surrogates, led by his running mate Sarah Palin, began sharpening a more specific story line. They seized upon Obama's past association with William Ayers, who, along with other members of the radical Weathermen group, bombed various government targets, including the Pentagon, in the early 1970s. Ayers long ago turned himself in and became a university professor and community organizer. In those capacities, he met Obama during the mid-90s. The two served together on a civic project founded by the Annenberg Foundation, and Ayers's work won him the Chicago Citizen of the Year Award in 1997. To Palin, though, what Obama did in the mid-90s was to forge a close and enduring tie with a "domestic terrorist." In fact, she has told rally after rally, Obama is even now "palling around with terrorists who would target their own country." No explanation of how a "domestic terrorist" became "terrorists." And not even any lip service to Obama's repudiation of Ayers's past bad acts. The Republican chairman in Virginia, Jeffrey M. Fredrick, goes further. He compares Obama to Osama Bin Laden. "Both have friends who bombed the Pentagon," he says. "That is scary." And so on. Obama as a terrorist, Obama as a Muslim, Obama as someone fundamentally different, someone mysterious to Americans, who doesn't share American values. Obama, who seems to want to lose in Iraq. By last week, the crowds at McCain rallies were turning ugly. Mention of Obama's name invoked cries of "terrorist!" or "bomb him!" or "traitor!" or "off with his head!" And little wonder, given this country's not-so-distant history, that the Secret Service contingent surrounding Obama is now laying on security measures rivaling those of the president himself. McCain has begun trying to tamp down the hostility, telling supporters at rallies that they have "no reason to be scared" of Obama. But Gayle Quinnell, for one, remains resolute. Obama, she told reporters after her moment on stage last week with McCain, is "a Muslim and a terrorist . . .all the people agree with what I said." And Fox News Channel, of course, remains hot on the case. A few days ago, Fox host Sean Hannity broadcast a segment titled: "Obama and Friends: The History of Radicalism." In it, introduced by Hannity as an "author and journalist," was none other than Andy Martin, originator of the anti-Obama e-mails. Martin helpfully explained to Hannity that Obama spent his early years "in training for a radical overthrow of the government." All of this, however, may now have actually turned against McCain. The New York Times published a new poll this week suggesting Obama now enjoys as much as a 14-point lead over McCain in the polls. And some of that, said the paper, is directly because of the character attacks.